The analysis of the costs for action versus inaction in addressing land degradation at national and sub-national (regional and district) levels in Russia showed that the total annual costs of land degradation due to land use and cover change only are about 189 billion USD in 2009 as compared with 2001, i.e. about 23.6 billion USD annually, or about 2 % of Russia’s Gross Domestic Product (GDP) in 2010. These land use and land cover changes occurred in the area of 130 million ha. The area of arable lands decreased by 25 % during the period of the economic reforms between 1990 and 2009. The total economic value of ecosystem goods and services is estimated to equal about 3700 billion USD in Russia, exceeding the conventional GDP by 3 times. The costs of action against land degradation are lower than the costs of inaction in Russia by 5–6 times over a 30-year horizon. Almost 92 % of the costs of action are made up of the opportunity costs of action. The methodology of the economics of land degradation can be successfully applied in peculiar socioeconomic conditions of Russia, but the lack of harmonization of methods and indicators brings uncertainty to quantitative assessments. The study was performed with a financial support of the Russian Scientific Fund (project no. 14-38-00023). Russia stretches over a large part of Eastern Europe and Northern Asia. The total area of Russia is more than 17 million km2 (Rudneva 2001). The vastness of the territory of the country inevitably leads to a diversity of natural conditions that causes the development of multiple economic uses of land resources. Climatic conditions have direct and indirect impacts on biological components of natural landscapes and soil forming processes. In their turn, the biophysical conditions determine the shape of agricultural development of the territory, with various land-use systems and with different major degradation processes. Figure 18.1 illustrates the nine major and accompanying processes of degradation of arable lands in Russia. The increasing degradation of land resources in many parts of Russia, manifested in numerous forms such as desertification, soil erosion, secondary salinization, waterlogging, and overgrazing, to name a few, considerably limits land productivity and the ability of land to provide ecosystem services (Table 18.1). Swamping and erosion result in the biggest affected areas. Salinization processes are most characteristic of the southern part of Volga Federal district (FD) (the Caspian depression, etc.). The major drivers of degradation include: climatic change, unsustainable agricultural practices, industrial and mining activities, expansion of crop production to fragile and marginal areas, inadequate maintenance of irrigation and drainage networks, and overgrazing. Socioeconomic characteristics of the regions of Russia are extremely heterogeneous. The population in each region of Russia varies in density and per capita income. Actually in rural areas the income is 40 % of the average income in cities (Nefedova 2013). The regions differ in terms of transportation networks, access to infrastructure, and the provision of social services. All these differences affect the ways and extent of the economic use of lands, but are also conditioned by them. The natural conditions and socio-economic factors determine the structure and the principles of land use in Russia. In the recent history in Russia, there was a rapid transition from state and collective farms formed under conditions of a planned centralized economy to private farms of various forms and sizes operating under market conditions. Such changes resulted in changes in land use, including of arable lands. Between 1990 and 2002, the economic reforms resulted in a drastic reduction in arable lands and cultivated areas. Since 2002, the area of arable lands in Russia has stabilized (Nefedova 2013). The State land records show that during the period from 1990 to 2001, the area of arable land has decreased by 8.5 million ha. During the period 2001–2006 the rate of land abandonment has decreased resulting in the decline of 1.9 million ha. In general for the period from 1990 to 2006 the area of arable land has decreased by 10.7 million ha (Federal State Statistics Service 2014a). Most of the abandoned lands were located in the regions with severe climate and poor soils; however, the biophysical conditions in the abandoned areas were not restrictive for agricultural production . Also, the reduction of the area of arable land was partly due to the formal transfer of the land from one category to another during the inventory undertaken by the legislation (Shoba et al. 2010). Following these reductions in the size of arable lands, the pressure on the fields remaining under use has increased, thus leading to more intensive use and creating conditions for the degradation of these most productive soils. Land degradation is a major challenge for the agriculture in the country, which is not properly addressed until now. We need deeper understanding of both the socioeconomic and biophysical drivers of land degradation in the Russian Federation. We have to estimate the cost of land degradation in Russia using a Total Economic Value (TEV) framework. The latter estimates tangible economic losses due to land degradation, such as the decline in the productivity of crops, together with the losses in non-market values of the ecosystem services, also essential for human and social well-being. What are the major drivers of land degradation in various zones of Russia with differing levels of socio-economic development, bioclimatic conditions, and resource potentials? What is the total economic cost of land degradation in large (Federal district level) and small (region level) administrative-territorial units of Russia? What is the value of potential benefits from sustainable land management in Russia? Thus, the first section of this chapter analyses the degradation and improvement of the land resources on a national scale with an emphasis on the period of economic reforms from 1990 to 2009 in Russia, where the area of arable lands decreased by 25 %. We provide an estimation of the costs of the measures for controlling land degradation and then compare this cost with potential losses of land value if no land protection or remediation action was taken. The main causes and drivers of these processes, both natural and socioeconomic, and the global consequences of these land use changes are discussed. The total economic costs of land degradation are estimated, including the losses in the value of non-marketed ecosystem services . The study also estimates the value of benefits from land improvement . Both land degradation costs and benefits from land improvement are estimated for the period of 2001–2009 at the Federal districts level in Russia. The second section presents a case study of the state of agricultural production and land degradation in the Azov district of Rostov region in the southern part of European Russia. The analysis is done on the basis of accessible information on the socioeconomic characteristics of the district, the state of agricultural sector, maps and the reports on the land resources of the district. The latter group of data sources includes three land use maps of the district for 1990, 2000, and 2010, the map of the land planning of the district, and soil maps in both raster (scale 1:10,000) and vector formats (scales 1:50,000 and 1:300,000). Other available remote sensing data have also been used. Three maps showing land-use change for three time periods were developed: 1990–2000, 2000–2010 and 1990–2010. We estimate the total economic costs of land degradation, including the losses in the value of non-marketed ecosystem services. The study also estimated the value of benefits from land improvement. Both land degradation costs and benefits from land improvement were estimated for the periods of 1990–2000, 2000–2010 and 1990–2010. where CLUCC = cost of land degradation due to LUCC; a1 = land area of biome 1 being replaced by biome 2; P1 and P2 are the total economic value (TEV) of biomes 1 and 2, respectively. By definition of land degradation , P1 > P2. In cases where P1 < P2, LUCC is not regarded as land degradation, but as land improvement (Nkonya et al. 2014). where CTAi = cost of restoring high value biome i; ρt = discount factor of land user; Ai = area of high value biome i that was replaced by low value biome j; zi = cost of establishing high value biome I; xi = maintenance cost of high value biome i until it reaches maturity; xj = productivity of low value biome j per ha; pj = price of low value biome j per unit (e.g. ton); t = time in years and T = planning horizon of taking action against land degradation. The term pjxj represents the opportunity cost of foregoing production of the low value biome j being replaced. where CIi = cost of not taking action against degradation of biome i. Given that the benefit of restoring degraded land goes beyond the maturity period of biome i, we have to use the planning horizon of the land user. Poor farmers tend to have a shorter planning horizon while better off farmers tend to have a longer planning horizon (Pannell et al. 2014). The planning horizon also depends on the type of investment. For example, tree planting requires a longer planning horizon than annual cropland management. We will assume a 30 year planning horizon for the afforestation program to redress deforestation and loss of woodlands and shrublands. We will use a 6 year planning horizon for grassland and croplands—majority of which are annual crops. As Nkonya et al. (2013) notes, land users will take action against land degradation if CTAi < CIi. Moderate Resolution Imaging Spectroradiometer (MODIS) remotely sensed datasets on land cover were used to identify the shifts in the land use and land cover in the region between 2001 and 2009 at the level of Federal districts of the Russian Federation. These included forests, grassland, cropland , shrublands (including woodlands), urban areas, barren lands, and water bodies. The MODIS land cover dataset is groundtruthed and quality controlled (Friedl et al. 2010), with overall accuracy of land use classification at 75 %. Following this analysis of the land-use and land-cover change, total economic values were assigned to each land use using the data from TEEB (The Economics of Ecosystems and Biodiversity) (van der Ploeg and de Groot 2010), using the benefit transfer approach. The following data sources and materials have been used for the evaluation of land degradation at the district level (Table 18.2). The size of agricultural lands in Russia is similar to Brazil and Canada. Since the late 1980s, the rural population of Russia declined sharply from almost 60 to 20 million people by 2010 (Federal State Statistics Service 2014b). Official statistics of Russia show that the density of rural population is about 2.2 persons/km2, the area of arable land is 122 million ha (about 23 % of the land fund of Russia). The area of arable land per rural person is 3.2 ha, and the share of the population employed in agriculture and forestry is 15.6 % (Federal State Statistics Service 2014a). It should be noted that the value for the average availability of cropland per one rural inhabitant is deceptive, because of the uneven development of the territory. In the share of employment in agriculture (15.6 %) Russia is comparable with other developing countries (Nefedova 2013). Since the territory of Russia developed unevenly, it is more informative to compare other countries with macro-regions of Russia, such as the federal districts (there are eight of them as of 2014), with similar agro-climatic conditions. For example, we can compare the Northern, Central, and Southern Federal districts with the countries of Northern, Central and Southern Europe, respectively (Table 18.3). The comparison shows that at a much lower population density (1.4, 11.0, 16.7 persons/km2, in the Northern, Central, and Southern Federal districts, respectively) and higher availability of land (1.2, 2.9, 2.1 ha/person, respectively), the Russian regions stand out with the higher employment in agriculture (18.9, 18.7, 16.7 %, respectively) than in the European countries with similar bioclimatic conditions (Nefedova 2013). The yield of the main crops in Russia is not high compared to other countries with rainfed agricultural production , and only Kazakhstan and Australia are surpassed by Russia. It means that the productivity of the Russian lands is not high and the gross volume of production is obtained through enormous use of land resources (Federal State Statistics Service 2014c). The yield of grain crops in Russia is far behind that of most Western countries. The average yield of grain crop is within 2100–2300 kg/ha, while in the US it is above 6500 kg/ha. Table 18.4 shows the structure of livestock for different categories of land tenure: agricultural organizations, households and farms. The share of livestock in agricultural organizations decreases in 2000s compared with other market players (households and farms). These results can be explained by the fact that since the reforms of the 1990s the demonopolization of the agricultural sector has occurred. Since the 1990s the application of water for irrigation, fertilizers, and other ameliorative facilities for intensification of land productivity in Russia has decreased in most Federal districts. These results can be explained by several facts. Overall, there was a reorganization of the agricultural organizations. Many unprofitable farms were closed and many lands were abandoned due to unfavorable performance. At the same time, due to lack of funding, the landlords began to invest less money in fertilizer and water for irrigation. Russia is far behind Europe in the density of paved roads. The total road density is below 50 km/1000 km2. The western part of Russia has a relatively high density of paved roads, but density falls gradually or abruptly from about 600 km/1000 km2 in the Moscow region to about 60 km/1000 km2 in the Novosibirsk region (the equivalent distance between Mexico and Canada). This gradient is similar to the yield of crops and many other agricultural indicators (Nefedova 2013). Agricultural production remains an important factor of regional development in Russia. Its share in gross domestic product in 2010 on average was 8 %, but in many regions, such as the Belgorod and Orel regions, agricultural production was about 30 % of the gross regional product (GRP). In the southern region of the Russian Plain it was from 20 to 30 % (Federal State Statistics Service 2014a). Unlike Western countries, where the agro-industrial complex (AIC) is dominated by manufacturing and services associated with the processing of agricultural raw material (feedstock), marketing, and supply and maintenance of agricultural production, in Russia it is dominated by raw agricultural products. The average annual salary in the agricultural sector in 2010 was 3500 USD with the average indicators in all the sectors of economy 6970 USD. In 1989 the wage in this industry reached the national average wage, so with this in mind we have to admit that agriculture and rural areas have greatly suffered (Federal State Statistics Service 2014a). Other socio-economic characteristics of Russia are shown in Table 18.6. The important outcomes of the reforms are: (1) double decrease in percentage of population living under the poverty level; (2) the increase of investments per capita; (3) slight increase in road density. The negative outcomes are: (1) decrease of population ; (2) decrease of share of employments in agriculture, which, at the same time, could have a positive impact if the modernization of agricultural industry occurs. Some experts (Nefedova 2013) distinguish 5 zones with different types of land development in Russia: 1—low level of land reclamation and land without reclamation in the North and East of the country (47 % of the total area of Russia): this group is characterized by small centers of agriculture, low population density, seasonal population migration, weak access to information, and traditional economy of indigenous peoples; 2—Forest area with mining of mineral resources, sparse (a few percent of territory) settlements and agriculture (22 % of the Russia’s territory): characterized by suburban agriculture, a small part of rural population , poor access to information, and the crisis of agricultural enterprises; 3—Forest agricultural area (13 % of the area of Russia and 30 % of the rural population): characterized by a developed industry, a big heterogeneity of land reclamation (from suburbs to the periphery), low density of rural population, and the decline of agriculture; 4—Mostly agricultural area (12 % of the area of Russia and 58 % of the rural population ) characterized by good land reclamation, with problems of over-plowed soils and aridity of some territories. These problems can be resolved within the framework of sustainable (rational) natural resource management; 5—Mountain pastoral area (6 % of the area of Russia, 8 % of the rural population) (Table 18.5). In Russia 70 % of the territory is characterized by sparse population, complexity of management and natural conditions, and sparse networks of paved roads. Soil resources are basic for sustainable agricultural production. To a great extent soils determine the agricultural practices and application of fertilizers. The Chernozem zone is the main base of grain production in Russia. Within this zone there are 85–90 % of lands that are under cultivation. Though it occupies about 12 % of the country’s area, more than 50 % of arable lands of Russia are concentrated here (Shoba et al. 2010). More than half of the arable lands of the country is represented by the Chernozem zone, 15 % are represented by the Albeluvisol/Phaeozem zone, and the extension of the Kastanozem zone is more than 10 % (Ministry of Natural Resources and Environment of the Russian Federation 2013). The agricultural sector was faced with several challenges at the very beginning: dramatic reduction of State support; the rudimentary state of market relations; the struggle for ownership; lack of coordination of government entities; the impact of the international market; the imperfection of the law and ignorance of the law; and the lack of feedback between society and the State. The reforms have resulted in several changes: the elimination of state monopoly on land (more than 85 % of lands were transferred to the ownership of individuals); the creation of an administrative land market (prices were established depending on the quality and location of the plot, with annual indexation); the population had the opportunity to purchase and sell land; and the account of unclaimed land and their transfer to municipal ownership was simplified. According to the Federal State Statistics Service (2014a) the share of loss-making enterprises reached a maximum in 1998 and amounted up to 88 % of the total. In 2010 unprofitable enterprises were only 28 % of large and medium-sized agricultural organizations. The share of all loss-making enterprises in the Russian Federation is 30 %. The decrease in the share of unprofitable enterprises was not only due to their coping with the crisis, but also due to the closure of non-viable ones. Employment in enterprises has also dropped from 8.3 million in 1990 to 2 million in 2010. Average acreage of enterprises decreased from 2.9 to 2.3 thousand ha. Catastrophic changes have occurred with an average number of cattle, which decreased from 1800 heads in 1990 to 130 heads in 2010. As stated earlier, a lot of land became unused, which led, on the one hand to a significant reduction of degradation processes in agricultural areas, but, on the other hand, on those lands that remained agricultural (usually the most fertile lands), the intensification of production was observed. Land degradation can be classified into physical, chemical, and biological types. These types do not necessarily occur individually; spiral feedbacks between processes are often present (Katyal and Vlek 2000). Physical land degradation refers to erosion; changes in the soil physical structure, such as compaction or crusting and waterlogging. Chemical degradation, on the other hand, includes leaching, salinization, acidification, nutrient imbalances, and fertility depletion, soil organic carbon loss. Biological degradation includes rangeland degradation, deforestation, and loss in biodiversity, involving loss of soil organic matter or of flora and fauna populations or species in the soil (Scherr 1999). Causes of land degradation are classified into proximate and underlying. Proximate causes of land degradation are those that have a direct effect on the terrestrial ecosystem. The proximate causes are further divided into biophysical proximate causes (natural) and unsustainable land management practices (anthropogenic). The underlying causes of land degradation are those that indirectly affect the proximate causes of land degradation (von Braun et al. 2013). The negative processes related to development of land degradation have reached alarming proportions at the beginning of 2000s in the Russian Federation. More than 20 types of land degradation processes can be identified, which lead to a deterioration in the quality of land, reversible and irreversible transfers of land from one category to another. In arable land, most degradation is caused by the development of processes of erosion and deflation, secondary salinization, reduction of humus, phosphorus and potassium content, and adverse values of pH. The reversible transfer of lands from one category to another is related to the covering with shrubs and woodland, the flooding of the floodplain meadows by water in reservoirs and clogging by the stones. Long-term and irreversible losses of arable land is due to factors such as the contamination by radioactive substances, the extraction of minerals, development of gully systems, subsidence effects associated with waterlogging of soil, and construction of residential and industrial buildings on lands suitable for farming (Kashtanov 2001; Dobrovolski 2002). The Federal program “Preservation and restoration of soil fertility of agricultural lands and agricultural landscapes as a national treasure of Russia in 2006–2010 and for the period till 2013” established indicators for restoration and rehabilitation of agricultural lands for 2010. These target indicators were exceeded by 2010; however, the rate of rehabilitation of degraded agricultural land is insufficient in comparison to the scale of land degradation in Russia. The area protected from water erosion, inundation and flooding, wind erosion and desertification constituted approximately 0.4 % of lands of Russia. The decrease in the degree of acidity of the soil was approximately 0.6 %, which equates to 0.06 % of the amelioration of solonetzic soils of all agricultural lands (Ministry of Agriculture 2011). According to estimates at the present time, the total expected yield of eroded and deflated arable land is about 25 % less than of areas not affected by erosion. It means that the loss is 400 kg per ha in the equivalent for grain, and for the entire country it is about 14 billion kg, even taking into account the actual low crop yields and low productivity of natural grasslands. The shortage of products from degraded grasslands is about 100 kg per ha of hay, which gives 1400 million kg loss for the total area of the country (Ministry of Natural Resources and Environment of the Russian Federation 2013). Erosion is evident in areas with hilly terrain. About 20 % of agricultural lands in Russia are on slopes steeper than 20 %. Under these conditions, water flow, resulting from intensive snowmelt or precipitation of heavy rainfalls, lead to the development of gully erosion. The total area of the gullies is 2.4 million ha (0.14 % of the total land area of the Russian Federation). The main part of the gullies are located on agricultural lands (0.6 million ha), forest (1.1 million ha) and protected environmental lands. Every year the area of ravines grows with devastating speed up to 180–200 thousand ha. The growth of gullies leads to the complete withdrawal of productive land or transforms it into other categories such as pasture or unused land. The land area affected by gully erosion is 2.5–3 times larger than the area of the gullies, because of the difficulties for operation of agricultural machinery. Due to production conditions they have low productivity and are eventually transformed into low productive grazing lands. The annual loss of production from these lands is estimated at 1200 million kg of grain (Ministry of Natural Resources and Environment of the Russian Federation 2013). Soil compaction leads to the loss of tillage performance by up to 5–10 %. Costs for fertilizer increase approximately by 1.5 times, as low-degraded lands require higher doses of fertilizers by 10 %, medium-degraded by 30 % and high-degraded 1.5–2 times (Gordeeva and Romanenko 2008). On heavily compacted soils yield reduction reaches 50 %. Low-compacted soils occupy 17 million ha; medium-compacted—69 million ha, and high-compacted—49 million ha of arable lands. Loss of fertility is 5–10, 20–30 and 50–60 %, respectively. Humus content is decreasing, the environmental condition of the soil is deteriorating, and more recently, the stability of the soils is decreasing. Humus storage in Chernozems is reduced annually by 0.62 t/ha over the last 15–25 years. Losses from the presence of acidic soils are 15–16 billion kg of agricultural products in terms of grain per year (Gordeeva and Romanenko 2008) (Table 18.7). As it was mentioned above, it is more useful to take into analysis the macro-regions of Russia, such as the federal districts, because they are more homogenous in climatic conditions, economic development, and land-use practices. We have taken into consideration eight Federal districts—Central, North-Western, Southern, North Caucasian, Volga, Ural, Siberian, and Far Eastern. Following Nkonya et al. (2011) we compare the changes in NDVI between 1981 and 2006 and some key biophysical and socioeconomic variables, such as precipitation, population density, government effectiveness, agricultural intensification, and Gross Domestic Product (GDP) (Figs. 18.2, 18.3, 18.4 and 18.5). Since such relationships could differ across the country, we disaggregate the analysis across the eight Federal districts of Russia. The analysis showed a positive correlation between changes in key biophysical and socioeconomic variables with NDVI in most of the Federal districts of Russia. The exceptions are the FD with large and more heterogeneous territory such as Siberian and Far Eastern FDs. The most positive results were in the Chernozem Agro-ecological zone—the southern part of Russia. Le et al. (2014) used 7 broad land use/cover classes (see Fig. 18.6) aggregated from 23 classes of the Globcover 2005–2006 data (Bicheron et al. 2008). Figure 18.6 shows the main land-cover/land-use changes compared to long term NDVI (1982–2006). The NDVI layer corrects for AF (atmospheric fertilization ), areas with a high positive correlation with RF (rainfall), and saturated areas of NDVI (see Chap. 5). The related statistics for Russia are shown in Table 18.8. Figure 18.6 shows that land degradation hotspots in Russia are mainly on forested areas, croplands and areas with sparse vegetation. These are areas affected by forest fires (Sakha Republic, Krasnoyarskiy territory, etc.) and crop land degradation (Saratov, Omsk, Tyumen, Kurgan regions, etc. ), due to processes such as salinization, degradation of irrigated lands, and desertification. In the case study of the Rostov region, we can also see the manifestation of cropland degradation processes. Table 18.8 shows that close to 20 % or more (except shrub-land) of each main land cover/use types were affected by degradation processes. Croplands, especially in the southern part of Russia, where the agricultural industry is more risky due to drought, wind erosion, and problems with moral obsolescence of the irrigation system, have the biggest percentage of degradation in Russia (27 %). Our analysis shows that Russia at the Federal district level has been experiencing dynamic land-use and land-cover changes (LUCC) over the last decade (2001–2009). Tables 18.9 and 18.10 present these changes over the period of 2001 and 2009, using the data from the Moderate Resolution Imaging Spectroradiometer (MODIS) remotely sensed datasets. We can see that the largest areas of croplands are in Siberian and Volga FD (Fig. 18.7). But the bioclimatic conditions of these FDs are far from the optimum. Arable lands of the Volga FD are affected by salinization and water erosion and of the Siberian FD are affected by erosion and desertification. Table 18.10 shows that Siberian, Far Eastern, and Ural FDs lost vast areas of grassland (66 million ha) and shrublands (55 million ha), which were almost totally converted into forestland (Fig. 18.8). The total addition to forests over the last period was 125 million ha. This conversion can be explained by land abandonment and reduction of the number of cattle over the last twenty years. The reduction of croplands still takes place in most of the territory. In some respects, this may be a beneficial change since ecological functions provided by forests are larger than grasslands and shrublands. Another positive impact is that Russia did not have a desiccation of the water bodies. The increase of barren lands by 4 million ha can be explained by intensive developing of mineral resources, industrial construction, and manifestation of degradation processes in the southern part of the country such as desertification and salinization. We have calculated the costs of land degradation in Russia using the approach described in detail in the methodological chapter of this book. The results show that the total costs of land degradation due to land-use change only (i.e. without the costs of land degradation due to lower soil and land productivity within the same land use), are about 189 billion USD during the period of 2001–2009 (Table 18.11), i.e. about 23.6 billion USD annually, or about 2 % of Russia’s Gross Domestic Product (GDP) in 2010. Most of these costs, about two thirds, are related to land-cover change in Siberian and Far Eastern districts. Land degradation costs per capita also vary among Federal districts: the highest in Far Eastern (1460 USD annually) and lowest in Southern, Central and Volga (18, 20 and 21 USD annually, respectively). The Total Economic Value of ecosystem goods and services is estimated to equal about 3700 billion USD in Russia, exceeding the GDP by 3 times. The relative value of ecosystems per capita depends on the territory, land use/cover characteristics, and 0. In this regard, the Far Eastern district with its huge territory, most of it under higher valued shrublands, forest lands, and grasslands, and relatively smaller population, has the highest per capita value of ecosystems in Russia. Whereas, for example the Central district, with the biggest population in the region and almost half of its territory consisting of croplands, has one of the lowest value of ecosystems. From another perspective, in the Far Eastern district the share of GDP of the Total Economic Value is just 5 %, this number is 334 % in the Central district and between 90 % and 97 % in the Southern, Volga and North Caucasian districts. This implies that population pressure on ecosystems is much higher in these four districts (Table 18.12). The results of the analysis of the costs of action, following the methodology presented earlier, are given in Table 18.13. The results show that the costs of action against land degradation are lower than the costs of inaction in Russia by 5–6 times over the 30 year horizon, meaning that each dollar spent on addressing land degradation is likely to have about 5–6 dollars of returns. The costs of action were found to equal about 702 billion USD over the 30-year horizon (Fig. 18.9), whereas if nothing is done, the resulting losses may equal almost 3663 billion USD during the same period. Almost 92 % of the costs of action are made up of the opportunity costs of action. This is one of the key barriers for actions against land degradation, as the costs are tangible and may need to be borne by landusers, as well as regional and federal budgets, however, the benefits of action are not fully internalized by landusers and often not even locally, as they represent global benefits from additional ecosystem services enjoyed by the whole world. At the same time, it is also true that these restored ecosystem services and goods would benefit first and foremost the people living in these degraded areas and Russian society as whole. Figure 18.10 showed the map with several layers: costs of action over the 30-year horizon in US dollars shown per hectare and land degradation hotspots . For example, we will look at the European part of Russia. This region should show the most accurate results because of the data used and benefit transfer approach. Three categories of lands might be distinguished: the first category—the degraded lands with high costs of actions; the second category—the improved lands with low costs of actions; and third category—cross-matches of the first and second categories. The cost of action of this category is from 2 to 11 thousand US dollars per ha. The areas are mostly concentrated in the southern part of Russia: the dig cluster consists of Astrakhan, Volgograd, Saratov, Orenburg regions. These regions are affected by soil salinity and alkalinity problems; the other cluster consists of Caucasia regions, which are affected by moderate and serve water erosion; the third cluster is Chernozem zone, where there is an intensive agricultural activity (the lands basically change into croplands); and last cluster is northern part (mainly Komi Republic)—the area of rivers and swamps. The degraded area is situated in the basin of Pechora and Usa rivers. We link these results with hydrological conditions and type of rivers dietary habits—mainly snow, which is not stable from year to year. It was shown that different sources come to the same results, so we can talk about land degradation in these regions with a big share of confidence. The cost of action of the second category is from 0.1 to 2 thousand US dollars per ha. The area is mainly the northern border of Central Chernozem zone, where many croplands, due to different reasons, which were described in the first part of the chapter, were changed to other categories (Fig. 18.7) and so land improvements occurred. It should be also taken into account that this area is less eroded and not affected by salinity and alkalinity as was the case in the southern part of Russia. The third category needs additional analyses on land degradation and improvement. The Azov district is a very favorable economic and geographical area of the Rostov region. Transportation infrastructure, skilled manpower, and lack of social tensions has historically defined the area as one of the largest centers of diversified industries, developed agriculture, science, and culture in the Southern part of Russia (Fig. 18.11). The Azov district is located in the South-Western part of the Rostov region. The total area of the district is 286.2 thousand ha. The Azov district has the largest population in the area. According to statistics, the population of the district is 90,642 people (Federal State Statistics Service 2014b). The demographic situation in the region continues to be adverse due to the natural decrease of population . Migration remains the main source of replenishment of the population. The agricultural lands occupy up to 73.9 % of the total area of the district, and the arable lands constitute 85.7 % of the agricultural land. The agricultural specialization of the Azov district is crop production, though livestock production also present. The main crops grown in the area are: winter wheat, spring barley, sunflower, corn, annual and perennial herbs, vegetables, and fruits. Agricultural production in the area is based on 26 large and medium-sized farms, 108 small farms, 107 individual entrepreneurs, 62 horticultural and 5 suburban associations, and a total of 33,892 households. The share of the State sector in the total number of registered entities is 5.9 %, and of private individuals is 94.1 % (Federal State Statistics Service 2014a, b, c). The structure of agricultural land use is: 210.4 thousand ha of agricultural land, including 182.5 thousand ha of arable land, 4.0 thousand ha of hayfields, 21.1 thousand ha of pasture, and 1.5 thousand ha of perennial plants. More than 25 % of the agricultural undertakings in the region have a positive profit margin. The gross grain harvest in 2010 was 353,300 thousand kg, with the average yield of 3900 kg/ha. The volatility of the yields of crops depends not only on fluctuations in the weather, but also from insufficient application of fertilizers and violation of farming system methods. At the same period of time in the seed-growing farms the yield was 4350 kg/ha. This fact indicates the presence of some reserves to improve crop yields in the district. However, there are issues related to losses of water, nutrients and carbon storage, and degradation processes. Large losses of water are found during the process of transporting of up to 40 % (instead of the projected 22 %) on water supply networks. Mostly from irrigation channels due to their physical and moral wear and tear. Burning stubble in the fields of agricultural enterprises is unauthorized but yet takes place in almost all territories of the region. Intensive development of negative processes and phenomena, such as water and wind erosion, loss of humus, waterlogging, salinity, alkalinity, soil pollution with toxic substances continues to take place. The region is affected by erosion, on more than 35 % of agricultural land. For combating erosion, it has been planned to plant windbreaks and to stabilize gullies by planting trees however only 10–20 % of the planned work has been performed. Desertification is the most important environmental and socio-economic problem of the region (Ministry of Natural Resources and Environment of the Russian Federation 2013). Natural soil fertility has to be maintained by application of fertilizers: organic and nitrogen fertilizers are applied in almost sufficient doses, while phosphate and potash fertilization is not enough (Table 18.14). In spite of the fact that the Azov district is in a zone of strong wind erosion and moderate water erosion, there is not enough attention aimed at the conservation of crops and lands from erosion on farms. The development of the erosion processes is insufficiently monitored in the region. Old soil survey materials do not reflect the processes of wind erosion. There are no ongoing works on reclamation of saline soils, while there are about 24,967 ha of soils with various degree of salinization in the district. The formation of saline soils in the district mainly occurs because of improper or excessive irrigation. Such phenomena occur in areas with shallow saline groundwater or saline deposits. Many farms do not comply with the recommendations (Ministry of Agriculture of Russian SFSR 1978). The climate of the Azov district is moderately continental with the average amplitude of temperatures 28.1 °C and the ratio of annual precipitation to potential evaporation of 0.7–0.8. According to the agro-climatic zoning of the Rostov region, the Azov district belongs to the dry zone. In general, the climatic conditions are quite favorable for the development of agricultural production , but some climate features such as drought, strong winds and strong fluctuations in other climatic indexes over the years, require a strict adherence of agricultural technology for the accumulation and preservation of moisture in the soil and protection of soil from wind and water erosion. In general, flat topography creates favorable conditions for soil management, plant care, and harvesting. The Azov district belongs to the soil province of Ciscaucasia Chernozems. The main features of the district’s soil cover are homogeneity caused by flat steppe conditions, as well as deep topsoil (humus accumulative horizon) and the accumulation of a large number of shallow carbonate salts. Also hydromorphic Chernozems, Luvisols, and wetlands soils with various degree of salinization are formed in this district territory. Ministry of Agriculture of Russian SFSR (1978) shows that in the Azov district 214,149 ha or 70.6 % of its territory is formed by Chernozems, among which 15,198 ha or 5 % of the soils are exposed to water erosion, and 23,074 ha or 7.6 % are exposed to wind erosion. Within the district there are 2657 ha of nitric soils, 2346 ha of sodic soils, 18,505 ha of saline soils (mostly floodplain), and 16.775 ha of wetland soils. Soil data analysis shows that in the district’s soil cover, potentially rich soils predominate. A high percentage of saline (6.1 %) and wetland (7.7 %) soils occur in the floodplains. The presence of eroded soils in watersheds indicates that after their improvement (melioration) and cultivation, there are additional opportunities for further development of agriculture and animal husbandry at the expense of not yet productive and sometimes unproductive land use. It is important to emphasize the necessity of sustainable use of cultivated soils and maintenance of their fertility. In accordance with the old system having been used in the Soviet Union, the agricultural lands of a farm are divided into agroindustrial groups. The last report of Ministry of Agriculture of Russian SFSR (1978) said that all soil types that are allocated in the Azov district are combined in 25 land management groups by taking into account their genesis, physic-chemical properties, water-air regime, geology, relief, etc. The first group included the best arable soils with no limitations for producing zonal crops. In the case of the Pobeda farm the soils of the 1st agroindustrial group included Chernozems and Gleyic Chernozems, and the recommended crops were winter wheat, corn, barley, millet, beans, and sunflower (Ministry of Agriculture of Russian SFSR 1978). It was recommended to cultivate sugar beet, and upland vegetable cultures in depressions. The complex of agrotechnical measures had to be directed on moisture accumulation in soil. Other groups included areas with weak development of wind and water erosional processes. They are also suitable to cultivate general crops. The complex of agrotechnical measures had to be directed on prevention of further erosion and moisture containment. The worst soils were included in the other agroindustrial groups: each of the groups had certain limitations in soil use and required special measures for soil protection. For example, sodification, salinity and severe erosion. It is not completely clear, if these recommendations are still followed at the Azov farms. The Southern Federal district is the most intensive agricultural region of the Russian Federation. The level of tilled lands in this region exceeds 80 %. Obviously, land-use change studies require spatially distributed research, which is time-consuming, even on the level of data collection. The compromise was to study one administrative district, the Azov district of the Rostov region (Fig. 18.12). The time interval for the study (1990–2010) was identified by the availability and accuracy of the data used. Multi-temporal maps were made to assess the variability of land use in the area (Bryzzhev and Ruhovich 2013). Figure 18.13 shows the plots where at least once during the analyzed period (1990–2010) the agricultural processing was not performed, was difficult, or did not give the intended outcome (harvest). The total studied area is 292,478 ha. Agricultural lands, i.e. lands that were processed at any given time (arable land, including irrigated areas, garden areas, etc. ), take up 193,261 ha (66 %) of the resulting data. The territory was subjected to different land-use changes. From 1990 to 2000, 10,355 ha (5.35 %) had changed, from 2000 to 2010, 5450 ha (3.5 %) changed. Bryzzhev and Ruhovich (2013) showed that despite the relative homogeneity of the district in climatic, geological, and topographical terms, for 20 years (from 1990 to 2010), more than 8 % of the territory ware affected by land-use change. The withdrawal of lands from agricultural use to under buildings—2584 ha. This process is controlled exclusively by the administration of the Azov district. Most often it does not depend on soil characteristics, so sometimes the best soils were removed from agricultural land. Agricultural activity, which was not previously active (fallow)—1535 ha. Termination of agricultural fields (deposits)—1210 ha. Processes related to the improvement/degradation of soil characteristics, as a result of climate change , land improvement, melioration, etc. The irrigation (of various types) of previously rain-fed agricultural fields—4136 ha. Irrigation was introduced on agricultural fields, mainly occupying automorphic areas. The development of a gully network—738 ha. The process leading to the increase in the area occupied by eroded soils. This is a process that is difficult to reverse, it is necessary to conduct special anti-erosion measures. One of the leading negative soil processes of the district is the process of soil salinization. Moreover, this process was exacerbated mainly due to improper planning of agricultural lands. The establishment of agricultural fields in the majority of cases is conducted by planting forest belts and roads along the fields. As a result saline soils were involved in tillage lands. The area of the saline soils occupies about 11 % of the total area of the Azov district, but it occupies about 2 % of arable land, i.e. there is not a specific need to use these lands for agriculture. But saline soils exist as fragments of many fields due to the rectangular cut of the fields bordered by forest belts and roads. Moreover forest belts and roads violate the original hydrological regime of the landscape, leading to the gradual spread of saline soils or increase of the degree of salinization. Agriculture in saline soils is unsustainable. Table 18.15 shows that the share of the shift to other land uses of non-saline soils was 7.2 %, but the same for saline soils was 17.3 % (2.4 times higher for the period of 20 years (Ruhovich et al. in press). It should be noted that the land-use changes of non-saline soils was mostly from building construction, the uprooting of orchards, etc. and in saline soils the changes were only due to the absence of harvest, due to salt regime. In addition, saline soils often hinder the passage of agricultural machinery, which leads to the fragmentation of fields and serves as a source of weeds. Our analysis shows that the Azov district has been experiencing dynamic land-use and land-cover changes over the last two decades: in 2000 relative to 1990 and in 2010 relative to 2000 (Table 18.16). Table 18.16 shows that Azov district totally lost areas of shrublands (4122 ha), which were converted mainly into croplands and urban territories. The total increase in croplands over the last period 2000–2010 was 2908 ha. This conversion can be explained by liquidation of orchard areas over the last ten years. The reduction of croplands in 2000 relative to 1990 can be explained by termination of processing of agricultural fields with subsequent construction of household outbuildings (including roads) or residential housings. The increase of grasslands by 235 ha, as it was mentioned before, can be explained by termination of processing of agricultural fields due to erosion or degradation of soil agronomy quality. The time period of 2000–2010 was chosen for economics of land degradation analysis due to the availability and accuracy of the data used. Our analysis shows that Azov district has been experiencing dynamic land use and land cover changes (LUCC) over the 2000s. 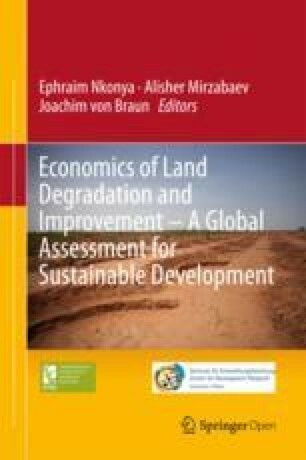 We have calculated the cost of land degradation in the region using the approach described in detail in the methodological chapter of this book. The results in Table 18.17 show that annual cost of degradation on the sample period due to land use change only, i.e. without the costs of land degradation due to soil-ecological conditions and productivity within the same land use, are 0.3 in 2010 as compared with 2000, in million USD. The land use shift happened because of favorable conditions for growing crops in Azov region. The Russian attitude to ecosystem value is rather low—52.5 USD per capita,2 which is ten times lower than in the developed countries. The total economic value of ecosystem goods and services is estimated to equal about 503 million USD in Azov district, doubling the TAP. The TAP/TEV estimation 48.1 % for Azov district shows us that there’s much else to do in economic activities besides agriculture (Table 18.18). Cost of action and inaction, presented in Table 18.19. The results show that the cost of action against land degradation in the Azov district will be 12.65 million dollars in a 6 year time period. For example the planned volume of financial support for the Russian Federal program for Melioration in 2014–2020 is 4012 million USD.3 The ratio of cost of action /inaction in a 30 years period is 94 %: 23.53–25.08 million USD, respectively. In other words every invested dollar against land degradation in this area will give back 1.07 dollars. We have to take this result as being critical, because the TEV used for these calculations are suitable for Russia as a whole, but in the Azov district more precise values might be different. The vastness of the territory of the Russian Federation inevitably leads to a diversity of natural conditions that causes the development of multiple approaches to the economic use of land resources. Climatic conditions have a direct and indirect impact on biological components of natural landscapes and soil forming processes. In their turn the biophysical conditions determine the shape of agricultural development of the territory, with various land-use systems and with different major degradation processes. The major drivers of degradation include climatic change, unsustainable agricultural practices, industrial and mining activities, expansion of crop production to fragile and marginal areas, inadequate maintenance of irrigation and drainage networks, and overgrazing. The calculations show that the total land use/cover dynamic changes are about 130 million ha, and the total annual costs of land degradation due to land-use change only, i.e. without the costs of land degradation due to soil-ecological conditions and productivity within the same land use, are about 189 billion USD for the period of 2001–2009. i.e. 23.6 billion USD annually. The total economic value of ecosystem goods and services is estimated to equal about 3700 billion USD in Russia, exceeding the GDP by 3 times. The costs of action against land degradation are lower than the costs of inaction in Russia by 5–6 times over the 30 year horizon, meaning that each dollar spent on addressing land degradation is likely to have about 5–6 dollars of returns. In our opinion this is a significant economic justification to favor rational agricultural and sustainable land use practices and also actions against degradation. Almost 92 % of the costs of action are made up of the opportunity costs of action. On the other hand, at the level of Azov district, Rostov province, we have found that the cost of action against land degradation is 1.07 times higher than cost of inaction . We recommend raising awareness on the ELD in Russia for improving the effectiveness of agricultural production , however we have to mention that the average TEV used in these calculations should be corrected in future work, with reference to Russian local surveys and data. Considering that for the majority of crops the sum of active temperatures (above 10 °C) should exceed 2500 °C, and the ratio of annual precipitation to potential evaporation should be over 0.75 (Shoba et al. 2010). Estimation taken from TEEB website. Ratio RUB to USD equal to 0.022. Bicheron, P., Defourny, P., Brockmann, C., Schouten, L., Vancutsem, C., Huc, M., et al. (2008). GLOBCOVER: products description and validation report. http://due.esrin.esa.int/globcover/LandCover_V2.2/GLOBCOVER_Products_Description_Validation_Report_I2.1.pdf. ESA Globcover Project, led by MEDIAS-France/POSTEL. Federal State Statistics Service. (2014a). Official statistics. Entrepreneurship. Agriculture, hunting and forestry. http://www.gks.ru/. (in Russian). Federal State Statistics Service. (2014b). Official statistics. Publications. Catalogue of publications. Demographic Yearbook of Russia. http://www.gks.ru/. (in Russian). Federal State Statistics Service. (2014c). Official statistics. Publications. Catalogue of publications. Russia and foreign countries. http://www.gks.ru/. (in Russian). Ministry of Natural Resources and Environment of the Russian Federation. (2013). Government report “On state and on environment protection in Russian Federation in 2012”. http://www.mnr.gov.ru. (in Russian). Open Access This chapter is distributed under the terms of the Creative Commons Attribution Noncommercial License, which permits any noncommercial use, distribution, and reproduction in any medium, provided the original author(s) and source are credited.